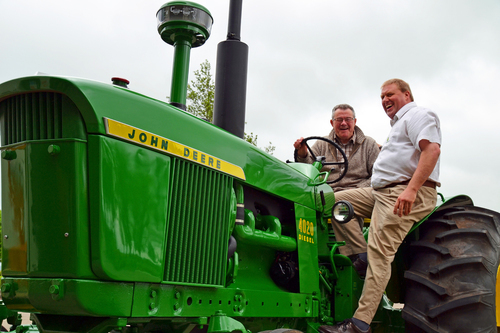 A 78-year old Staffordshire man achieved one of his life’s ambitions when he took two John Deere tractors, spanning 50 years of production, for a spin at the company’s UK headquarters in Langar, Nottingham last month. “I’ve driven most things in my time but never a tractor of any description, and it has always been my dream to drive a John Deere,” says Tony Hales. Tony is a retired production director from Newcastle-under-Lyme who spent 50 years working in the ceramics industry in Stoke-on-Trent, and he has been married to his wife Ann for 54 years. “I only ever wanted to be a farmer from when I was a small boy. I spent much of my childhood riding around with the son of a neighbour who owned three cattle lorries, visiting cattle marts and even abattoirs. Tony and his grandson James Ackerley, who thought of the idea, were invited to visit Langar by the company’s product marketing manager Mark James, who collects and restores vintage and classic John Deere tractors in his spare time. Mark arranged for Tony to drive a modern 6175R tractor and the UK branch’s pride and joy, a specially restored 4020 model (nicknamed BEV after its number plate) dating from 1966, when John Deere Limited first started trading from the same premises. “I’ve always wanted to drive a John Deere tractor, nothing else would do, although there were very few if any around in my youth – they were all Fordson Majors and Little Grey Fergies,” says Tony. “We’ve always talked about John Deeres in the family, and my grandson James bought me a scale Model L vintage tractor a few years ago as a present. For some reason I’ve always been attracted by the colour scheme – they mustn’t ever change it! “Driving the two tractors, it makes you realise just how things have moved on over the last 50 years. For comfort I preferred the modern tractor, obviously, but I should need six months to learn how to use all the electronics! It was also very noticeable how hard it was to change gear in the older model, but I really enjoyed driving them both, it was an absolute pleasure and definitely worth coming.